Slash some beats with K/DA. 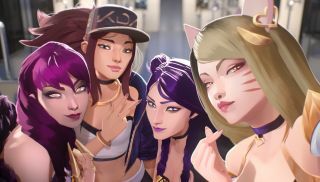 League of Legends’ fictional pop act K/DA continues to enjoy the sort of popularity normally exclusive to flesh and blood performers. Their hit song Pop/Stars reached the top of Apple Music’s pop and K-pop charts after it was performed during the World Championships, and now it’s spreading to other games. Today, you can play the track in Beat Saber, the neon VR rhythm game. Ahri, Akali, Evelynn and Kai’Sa’s tune is available now, so you can slash away at some beats with your lightsabers. You’ll need a VR headset, of course, and Beat Saber supports the HTC Vive, Oculus Rift and Windows Mixed Reality. It’s a good fit. K/DA is a virtual group whose first gig was an augmented reality extravaganza in front of a live crowd, so a VR game sounds like a logical leap. Beat Saber is still in Early Access, but at launch it quickly became the highest rated game on Steam at the time with a 99 percent positive rating across nearly 2,000 reviews. It’s at 97 right now, so it remains pretty popular. As well as the new track, the free update makes a couple of tweaks to practice mode. The settings screen now plays an audio preview when you change a song’s start time, while levels start with an intro before the start time you set, to avoid instantly failing the track.